So it has been a bit chilly this winter, and going out to take pictures when it's below freezing isn't the funnest way to pass time. But on Sunday it was actually warm, with the temperature up in the 60s. 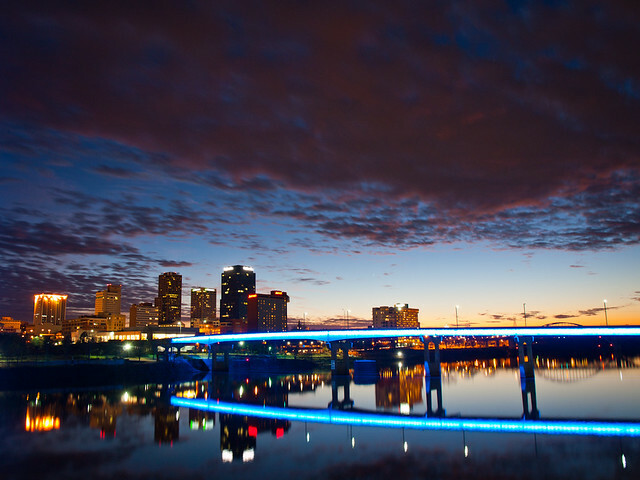 So I took advantage of the sunlight and warmth and drove to take pictures of the new lights on the bridges in downtown Little Rock. I left home a few minutes too late, and just barely missed the sunset. I was going over the I-30 bridge and saw the sky lit up in bright oranges and red. By the time I stopped at a good spot for a picture, the best light had faded away some. I headed over to the Junction Bridge to take a few pictures as it began to get dark. 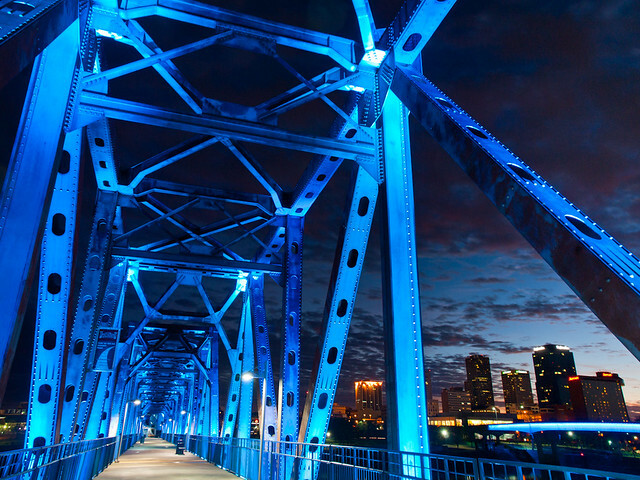 The Junction Bridge is an old railroad bridge that was built in 1884, but converted into a pedestrian bridge in 2008. 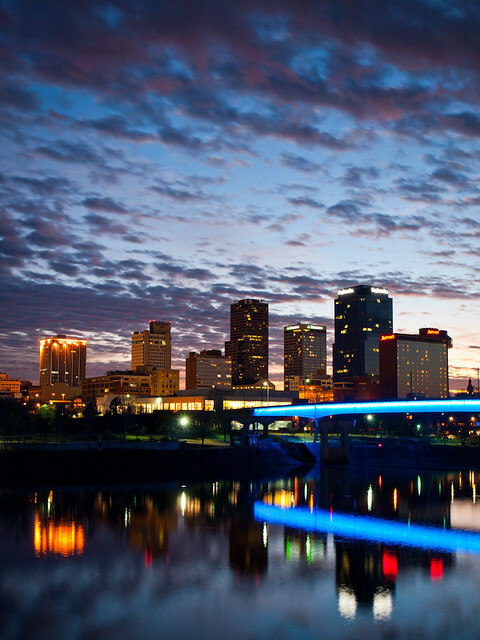 It's one of the best places to get pictures of the Little Rock skyline. 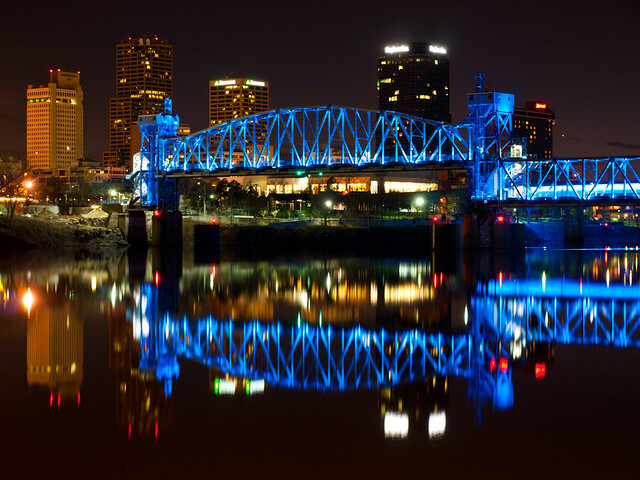 The Junction Bridge also sits right on top of the actual "little rock" that gave the city its name. In fact most of the old rock was destroyed when the bridge was built (apparently historic preservation wasn't that big of a deal back in the 19th century). The city built a nice plaza at the foot of the bridge a few years ago, and put a few chunks of the rock on display. I've been meaning to get out and take pictures of the downtown bridges for a few weeks now. The electric company recently installed some fancy new LED lights on the Main Street, Junction and Clinton Park Bridges. The new lights definitely make the bridges stand out more. I was amazed at how still the river was that night. There was hardly any wind, and the river looked like glass. This is a great place to take pictures. The only downside is that when you're hungry, you can start smelling all of the aromas from every nearby restaurant in the River Market District and Argenta. I hadn't had dinner yet, so I was starving the whole time I was taking pictures out there. The office was closed last Monday for Martin Luther King Jr. Day, so I used my time for a chance to get a few pictures. I met up with John, who was keen on taking his new car out on a photo trip. It was bright and sunny, not the best conditions for photography, but we headed out towards east Arkansas. Along the way we passed by this old house, which looks like it has been abandoned for a long time. I peeked inside, the front rooms were filled with an assortment of random and creepy pieces of junk. Scott is a neat little community, located about 15 miles east of Little Rock. 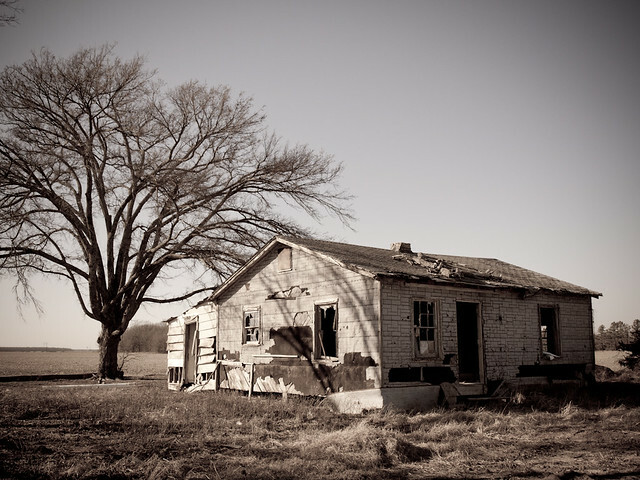 It's an old town, surrounded by miles of farm land and old homes, barns and plantation buildings. There are also thousands upon thousands of pecan trees around Scott. 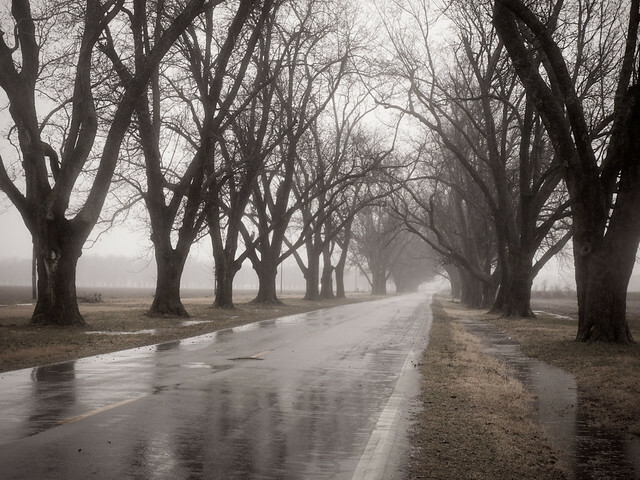 Pecan trees line the main road through the area, stretching for a few miles. I've taken a lot of pictures out there over the years, but I've really been wanting to get a shot there of the road in a thick fog. A few days ago, it was really foggy and I got my hopes up. I was at work, and anxiously kept looking out the window. Maybe, just maybe, I could rush home from work and get the camera, then hurry to Scott to catch the road in the fog? All that before it got dark? So I left work and sped east towards Scott, only to find that there wasn't much fog there. Dang. 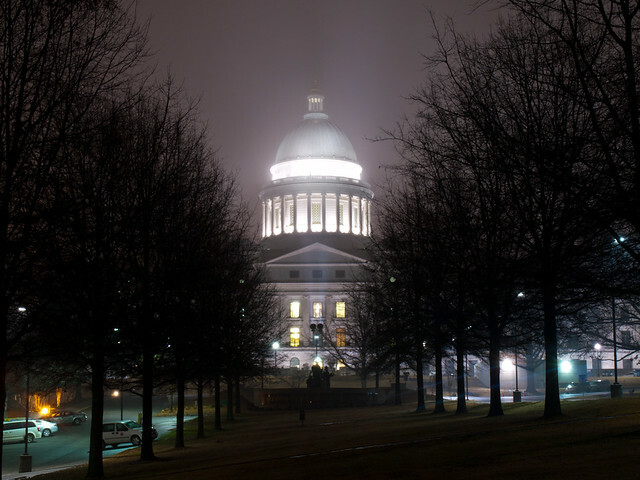 It was another foggy night, so I grabbed the camera and headed to downtown Little Rock to try to take some pictures. I really wanted to get shots of the new lights on the river bridges. But as luck would have it, the lights were off that night so some maintenance could be done. 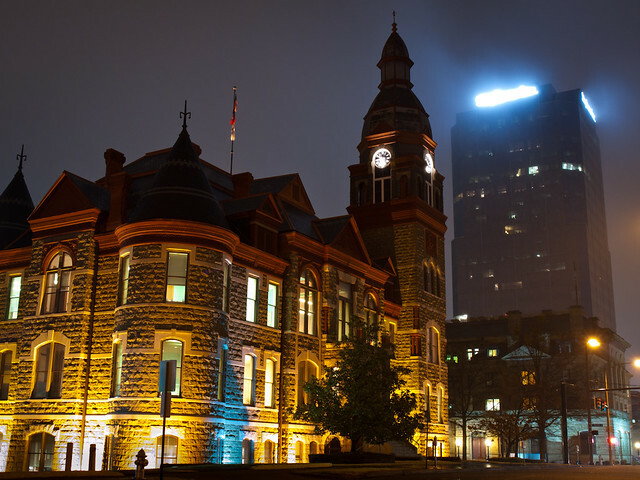 I drove around a few other places and stopped along Second Street to get some pictures of the Pulaski County Courthouse and the Stephens Building. 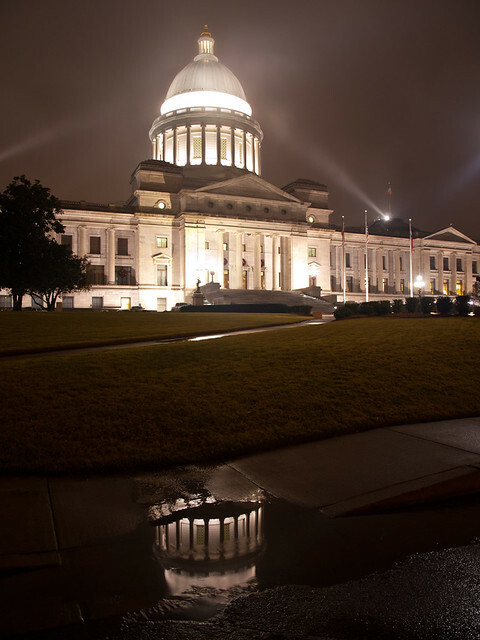 After that I drove by the state capitol again. This is the view from behind the capitol, taken as it started to rain. 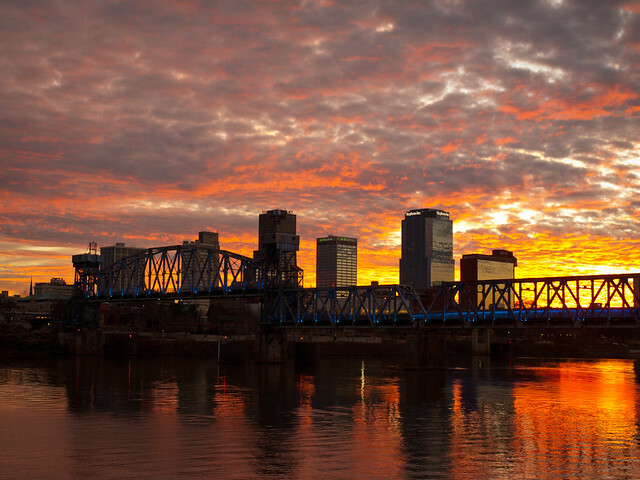 It was really cold, below freezing, when I drove through downtown Little Rock the other day. It's the kind of weather that makes you want to stay inside, but I had the camera with me so it seemed like a good idea to try to get a picture of something. I drove by MacArthur Park, and got out to take some pictures of the Little Rock Arsenal Building. This is one of the oldest buildings in the city, dating way back to 1838. 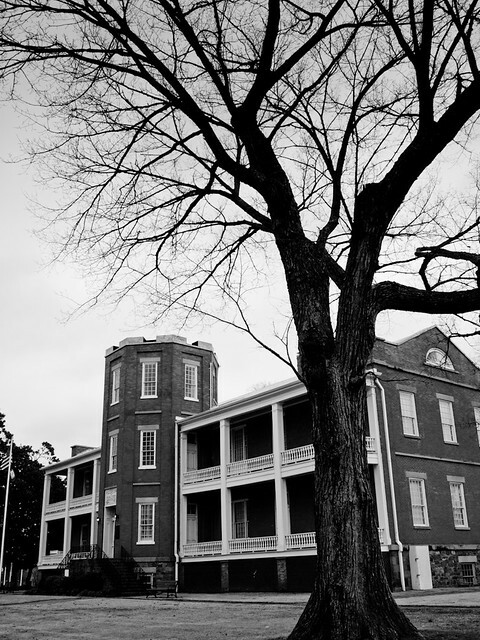 The building served as part of the old federal arsenal, and now houses the MacArthur Museum of Arkansas Military History. 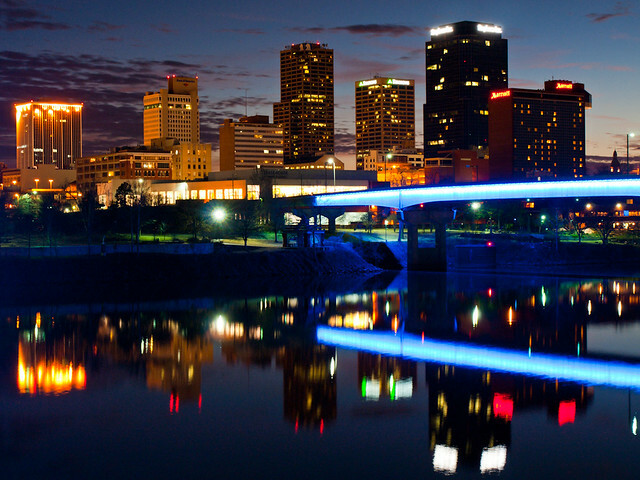 January 29: Little Rock, Arkansas. 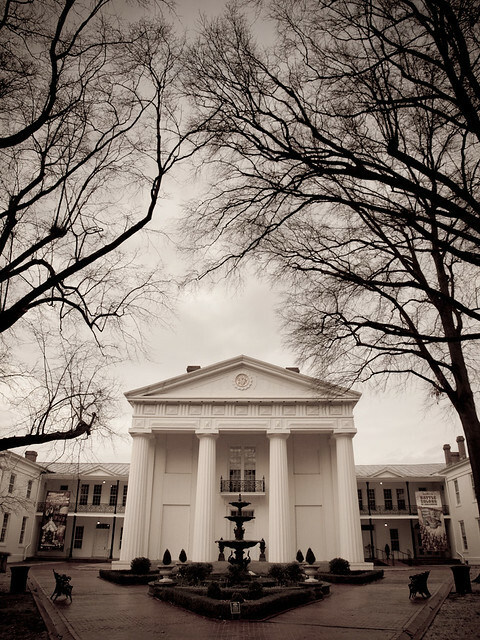 The Old State House is one of the oldest buildings in Little Rock, and it is surrounded by tall oak trees. Taking this picture reminded me of the time my family headed down to the Old State House in 1992 to watch Bill Clinton's election night victory party. But then I had the sudden realization that this happened 20 years ago, which made me feel old. February 23: Petit Jean State Park, Arkansas. 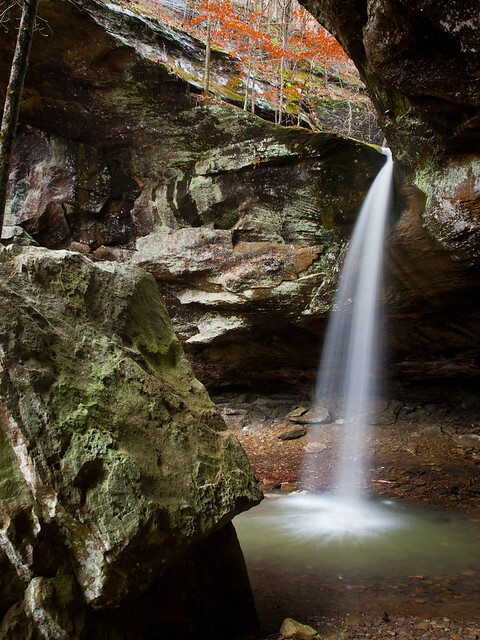 The trail to Cedar Falls is one of the prettiest, and popular, hikes in the state. 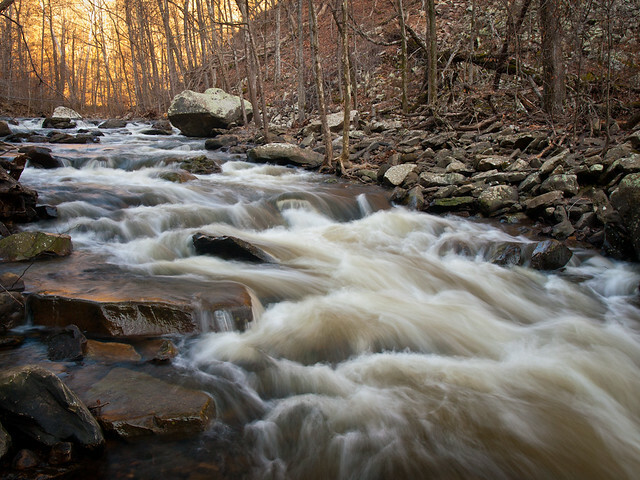 This was taken on a cold winter afternoon, as the setting sun cast a golden glow above the creek. April 7: North Little Rock, Arkansas. It's amazing that the tall trees in Riverfront Park in North Little Rock are there, that they managed to survive for decades without being torn down and replaced with buildings or parking lots. 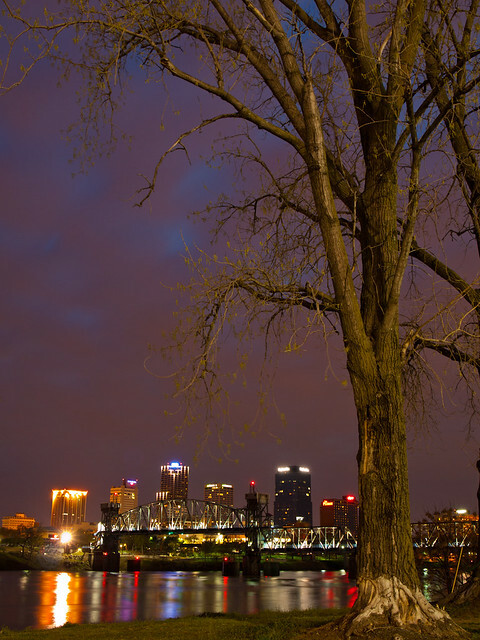 I liked this angle, where the tree seemed to tower over the city across the river. November 21: Little Rock, Arkansas. One time this year I rushed to drive out to the state capitol, hoping to get a few pictures of it with some interesting clouds in the background. I parked and got the camera out, only to discover that I managed to forget all of the memory cards in the camera bag. Luckily that didn't happen on this trip, when the capitol was shrouded in a thick fog. 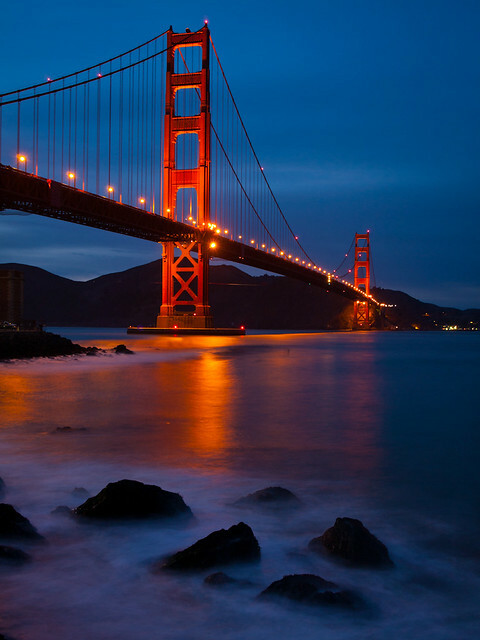 November 3: San Francisco, California. So in 2013, my beautiful wife and I decided to get married. And so we did, at the end of October. We went to California for the honeymoon (so be ready for several more pictures from the trip below). 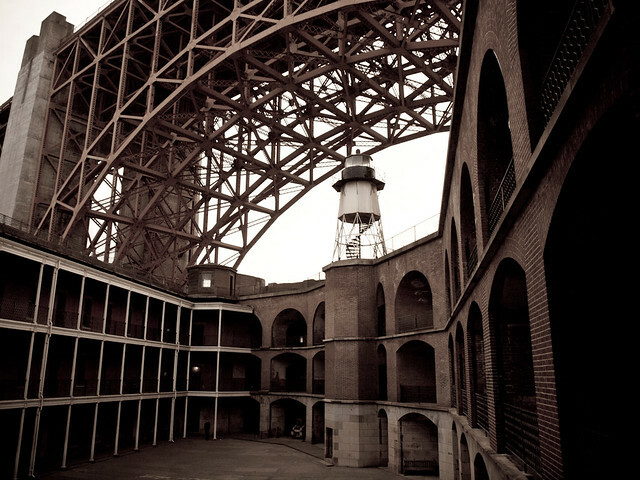 This is Fort Point, an old Civil War fort that was built to protect the San Francisco Bay area. It's an interesting place, since you don't see too many Civil War forts with the Golden Gate Bridge towering above them. A summer thunderstorm was dropping some menacingly large bolts of lightning when I stopped to take this picture in the metropolis of Hagarville (population 129). 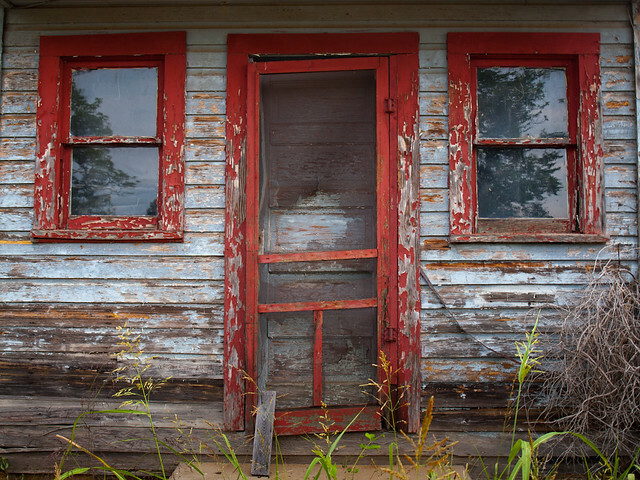 In the center of town sits an old store and duplex, long abandoned and fading away. July 21: Near Roland, Arkansas. 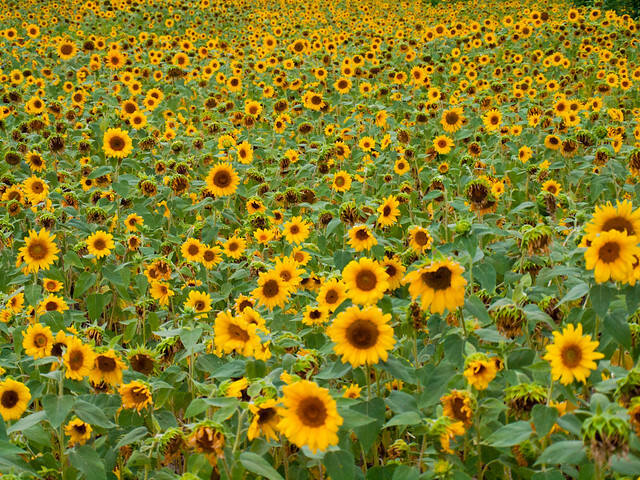 This field of sunflowers is close to Little Rock, only about ten miles from Pinnacle Mountain. I drove out there after work one day, and tried to take some pictures while not getting stung by any bees (there were a lot of bees out there). 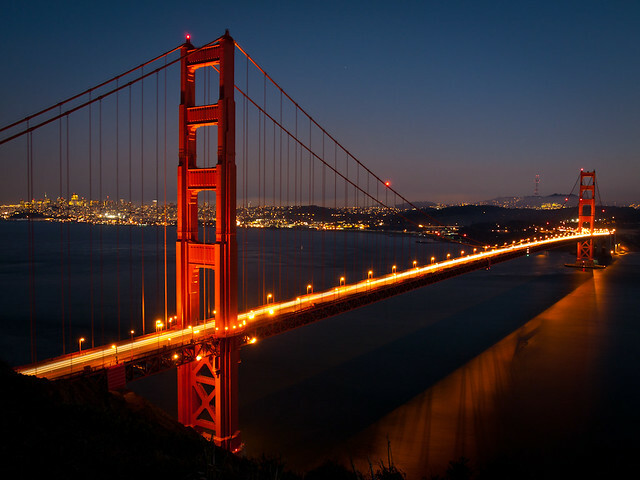 October 29: San Francisco, California. After some initial problems with United Airlines, we finally arrived in San Francisco to start the honeymoon. One of the places we visited was Alamo Square, which has one of the most famous views of the city. 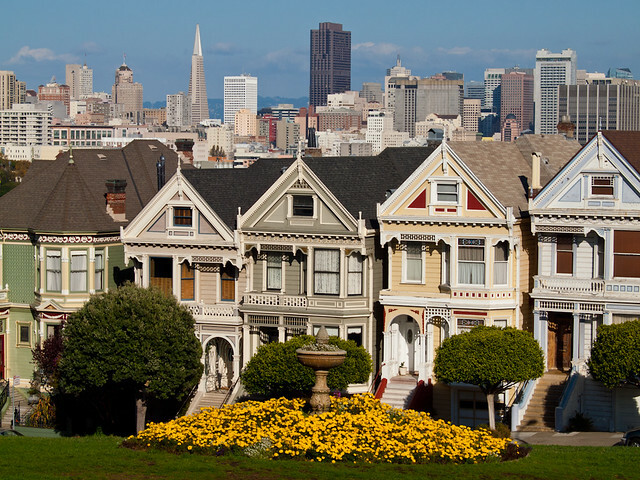 It's also famous because this is the view shown in "Full House," so there were several people there singing the shows theme song and/or getting it confused with "Step By Step." It's a popular place, and I had to wait awhile to get a view without any people laying in the grass. October 5: Alley Spring, Missouri. 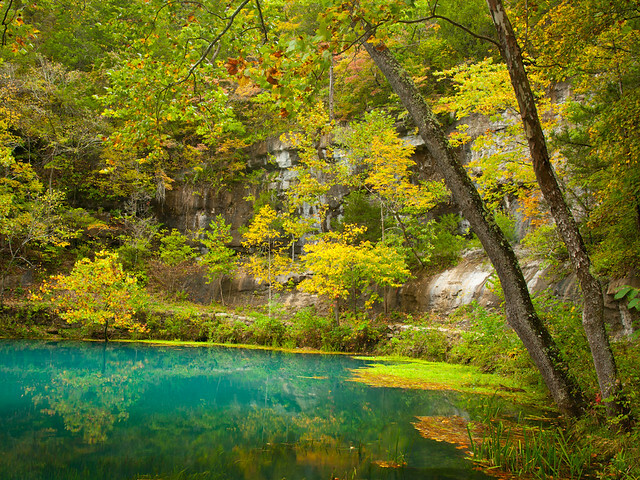 About 81 million gallons of water gush out of the spring every day, making it the 8th largest spring in the Ozarks. The water from the spring has a really deep blue color, thanks to suspended particles of limestone and dolomite. The spring is part of the Ozark National Scenic Riverways, and I was afraid we wouldn't be able to see it during this trip. This was taken during the federal government shutdown, and all of the campgrounds and access points nearby were closed. But luckily Alley Mill and Spring were open, which are worth the long drive up into Missouri to see them. July 27: Buffalo National River, Arkansas. 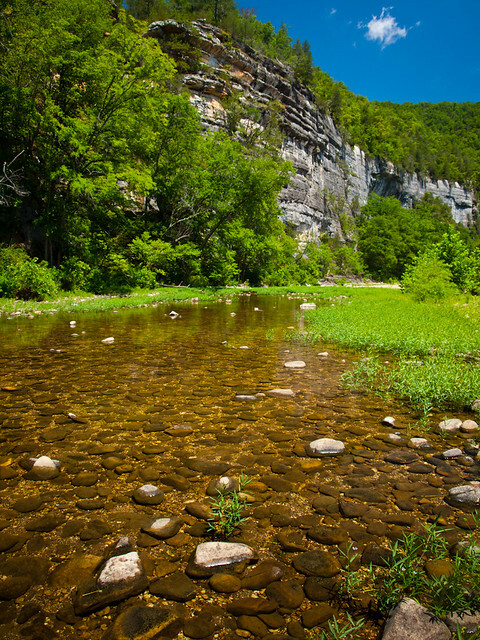 This was taken at the foot of Roark Bluff, along the Buffalo River. This is one of my favorite places to take pictures. This is also just a few feet away from the spot where I proposed to my girlfriend. Luckily, she said yes and I didn't drop the ring in the river. 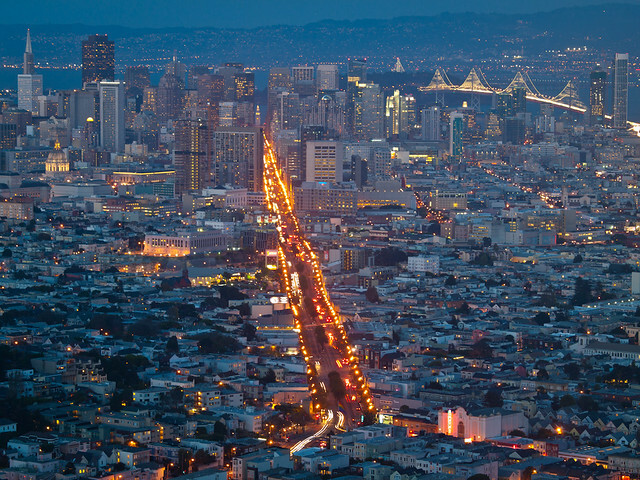 October 30: San Francisco, California. San Francisco is an amazingly beautiful city, and seeing this view was one of the highlights of the trip. To get here we got to drive across the Golden Gate Bridge. And after the sun set, we drove back into the city and had some of the best pizza I've ever eaten (Tonys Pizza Napoletana, near Telegraph Hill). 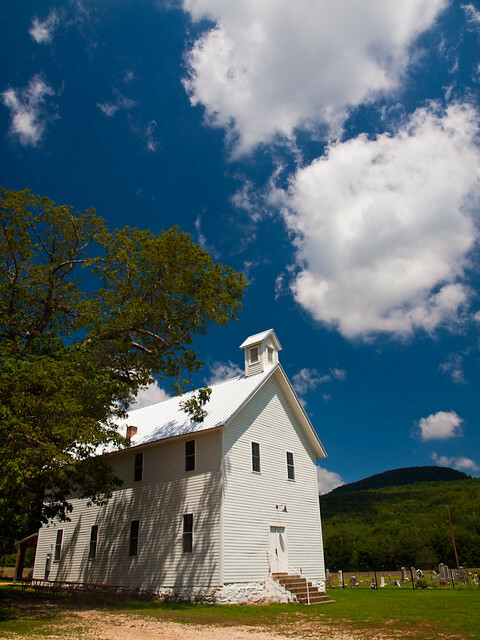 The Boxley Baptist Church was built in 1899, and is probably one of the most photographed buildings in the Ozarks. It's a neat old building in a great setting, so I didn't hesitate in taking a few more pictures of it when I had the chance. 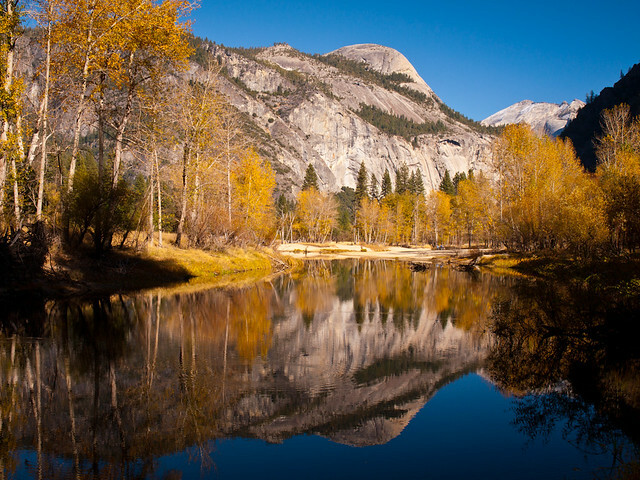 November 2: Yosemite National Park, California. 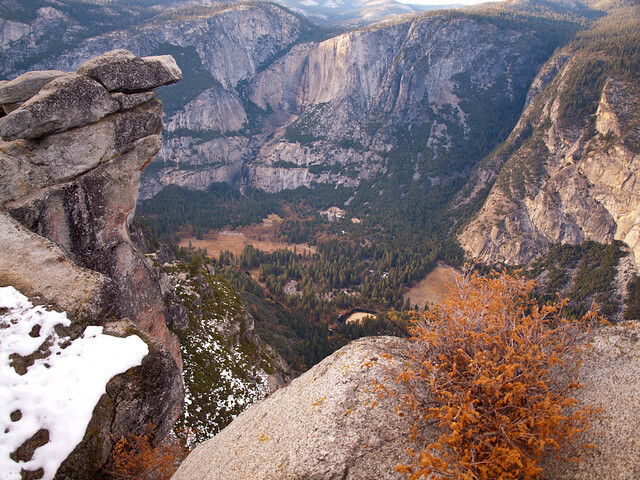 This is the view of Yosemite Valley from Glacier Point. Along the way there, I thought it would be a neat idea to hike the short mile-long trail to Taft Point. What I failed to take into consideration was the altitude there, which is only about 7,000 feet higher than what I'm used to. After getting back to the car, I was thrilled that you can pretty much just drive right up to the overlook at Glacier Point. July 26: Sam's Throne, Ozark National Forest, Arkansas. It was a strange summer here, being a bit cooler than normal (with only a handful of days over 100). I drove up to Sam's Throne one night after work to camp. It had rained earlier that day, and there was fog drifting through the valley below like a snake in water. 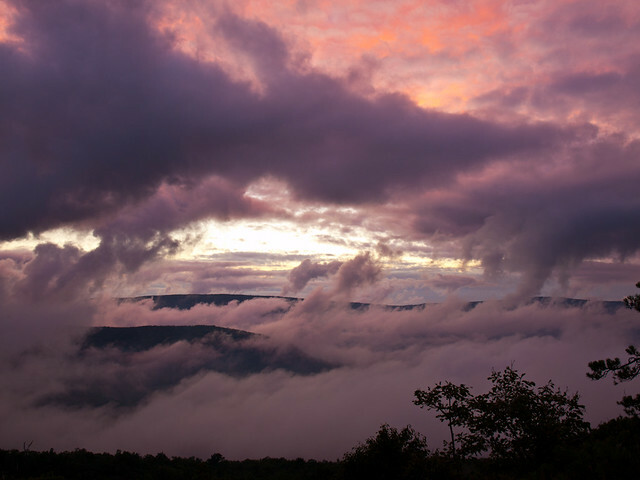 At dusk the fog rose up, and then turned pink and purple as the sun set. 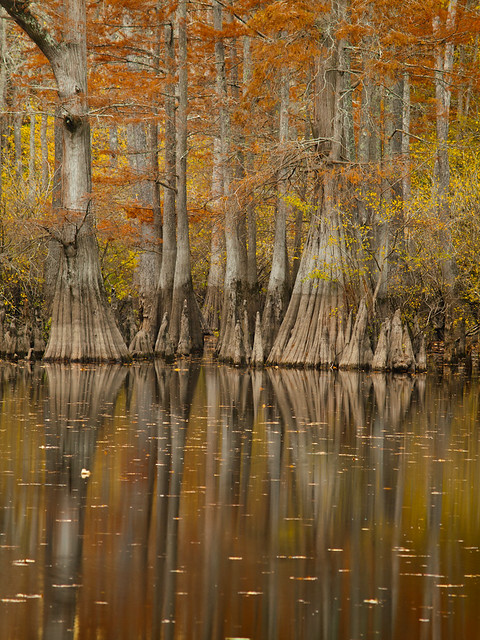 November 10: Dagmar Wildlife Management Area, Arkansas. This is another one of my favorite places to take pictures. 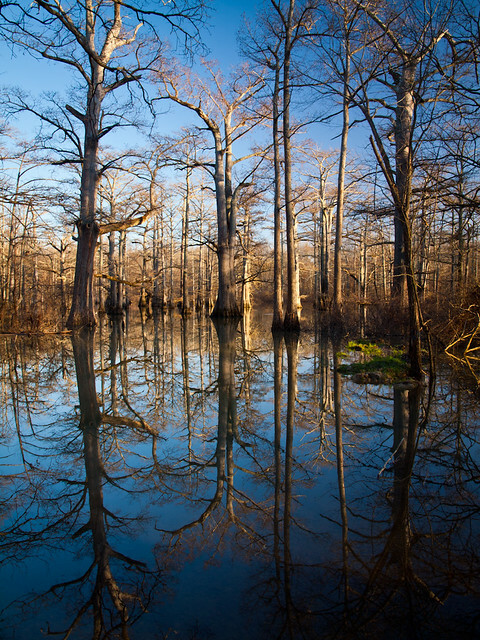 It's a neat area with swamps and lakes that are filled with cypress and tupelo trees. And all of it is just a relatively short drive from Little Rock. It was a good time of year to visit Dagmar, since it was cold enough to get rid of all the snakes. December 22: Pam's Grotto, Ozark National Forest, Arkansas. At the end of our first day in San Francisco, we went to an overlook that sits atop one of the tallest hills in the city. The view was amazing, with the entire city and Bay spreading out below like a blanket. It was a beautiful view, worth standing in the cold wind to take a few pictures of. August 20: Pinnacle Mountain State Park, Arkansas. It had been a few years since I made the climb to the top of Pinnacle Mountain, so for some reason I decided that a day in August would be the perfect one to make the hike. As I sat on top of Pinnacle waiting for the sunset, the rest of the park was closed while the state police were conducting a manhunt. Someone had shot at a park ranger, so the park was partially shut down while the police searched. But It was quiet and calm at the top of the mountain. 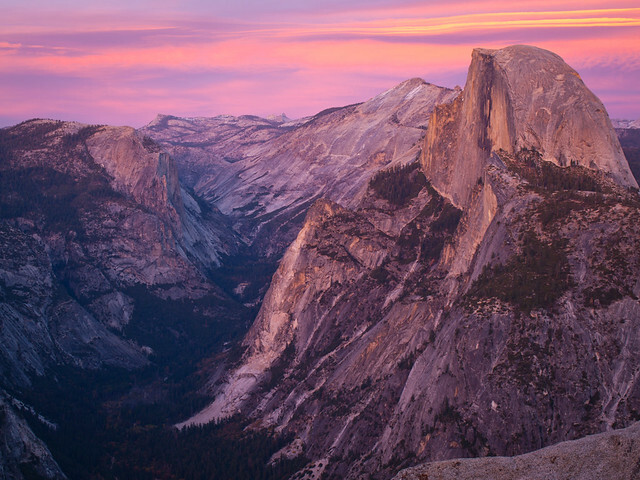 November 1: Yosemite National Park, California. Yosemite definitely lives up to its reputation. It's incredibly scenic, I wanted to stop the car every five minutes to take pictures. 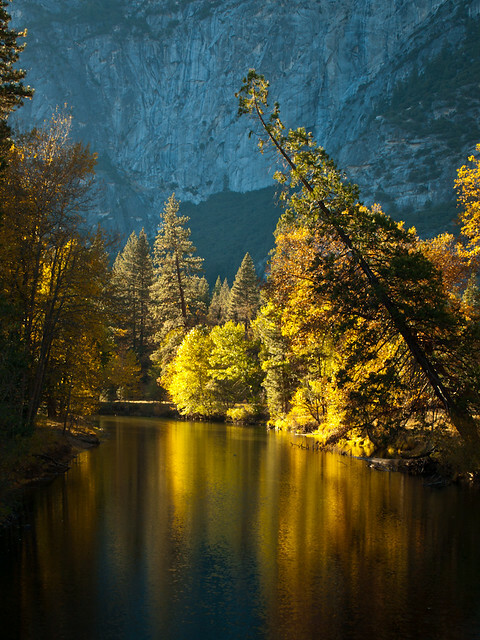 This was the view from a bridge over the Merced River, as late afternoon light streamed through the valley. April 15: Flatside Pinancle, Flatside Wilderness, Ouachita National Forest, Arkansas. 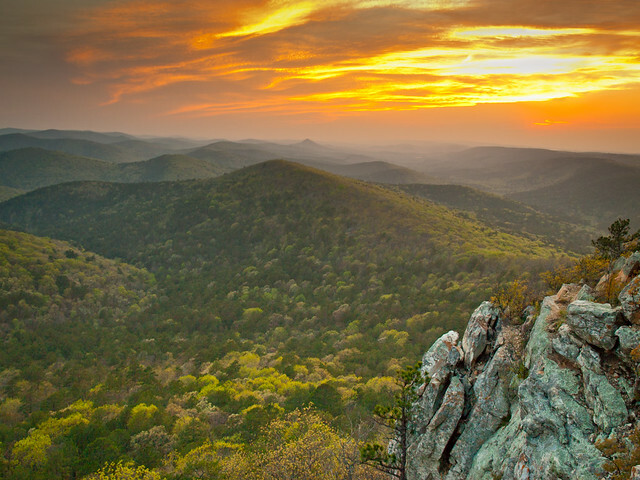 One evening in the Spring we drove up to Flatside, which is an amazing overlook that is only about an hour from Little Rock. 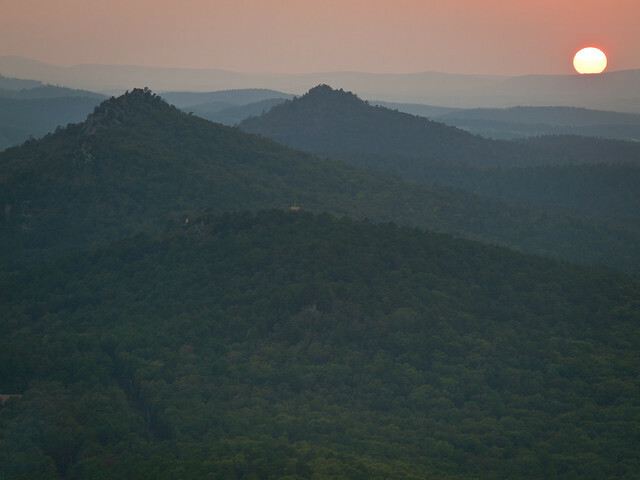 The views of the wilderness and the rolling Ouachita mountains is one of the best in the state. We were lucky to have a pretty good sunset too. 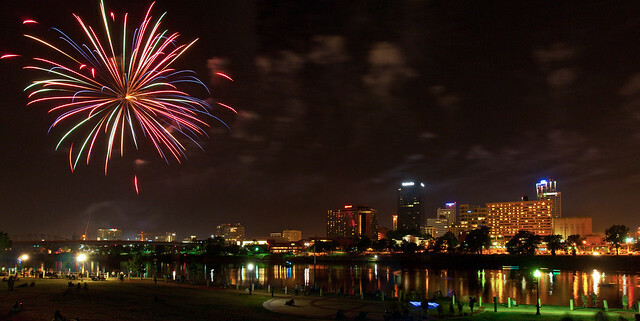 July 4: Little Rock, Arkansas. After being sent to Dallas for work (which wasn't good timing, there weren't any soccer games that week) I made it back in time for Independence Day in Little Rock. We headed down to Riverfront Park in North Little Rock for the fireworks show, on a night that was surprisingly cool outside. We were driving through Yosemite Valley when we decided to stop for lunch. The first picnic area we saw was at Sentinel Beach, and after eating we walked down to the river and found this amazing view. If we weren't hungry, we would have driven right past this scene. October 5: Hodgson Mill, Missouri. 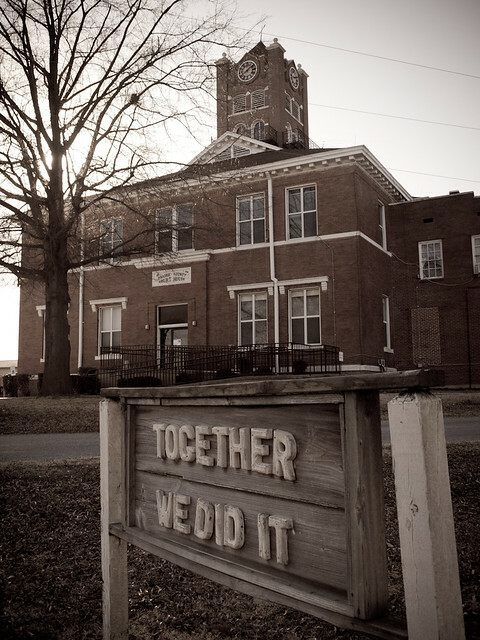 This is said to be one of the most photographed buildings in Missouri, and I'm definitely going to be making a few more trips up to this amazing spot. 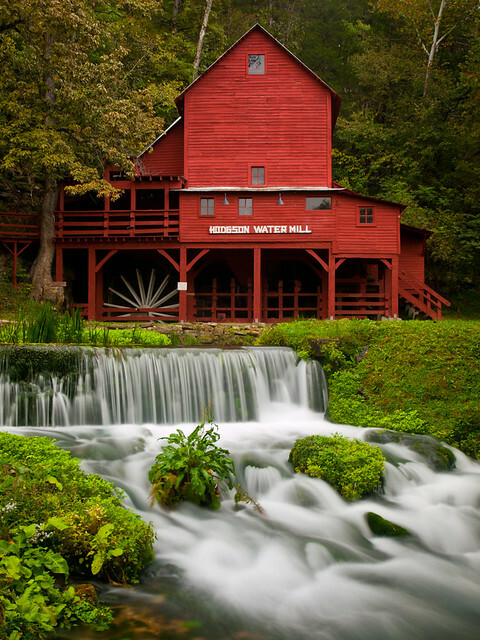 The mill was built in 1897, and sits above a spring where 23 million gallons of water flow out every day. I took over 3,000 pictures during the trip to California, and probably half of those were of the Golden Gate Bridge. This was taken near Fort Point (from #21 above), as dusk settled in over the city. We weren't the only people out there, about a dozen people were out trying to surf in the water just beyond these rocks.